Last Friday, a group of over 300 migrants and migrant rights activists arrived in Mexico City to protest Mexico's harsh anti-immigration policies. 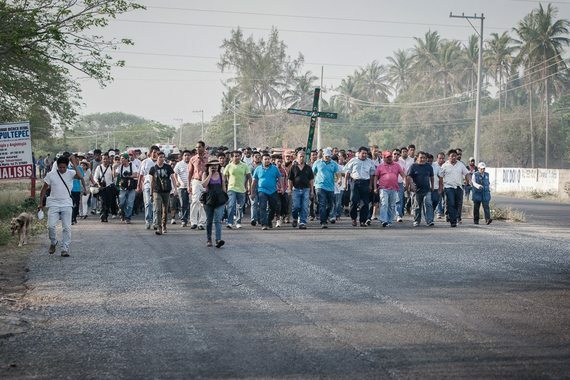 Led by Father Alejandro Solalinde -- head of the Pastoral of Human Mobility of the Mexican Episcopacy -- the group hoped to draw attention to Mexico's new "Frontera Sur" program, which cracks down on Central American immigration into Mexico from its southern border. But what started as a peaceful protest has grown into a raging controversy -- over the fate of the migrating protestors and the safety of all of Mexico's migrants at large. Using violence and intimidation, the Mexican government attempted to quell the protest before its arrival in the capital. Earlier this month, the authorities trapped the group in Father Solalinde's shelter in Oaxaca for over a week. Surrounding the shelter, federal authorities claimed they would deport all of the migrants inside and arrest the local activists for human trafficking. Defiant, the group decided to follow through with its journey to Mexico City, confronting police brutality and a stream of threats along the way. The controversy marks a new era in North American immigration control. Through the Frontera Sur program, the United States has successfully outsourced elements of its border control to Mexico, as the Mexican federal government picks up that mission with vigor. "Mexico is expelling its migrants," said Father Solalinde last Tuesday. "This government is doing the dirty work for the United States." 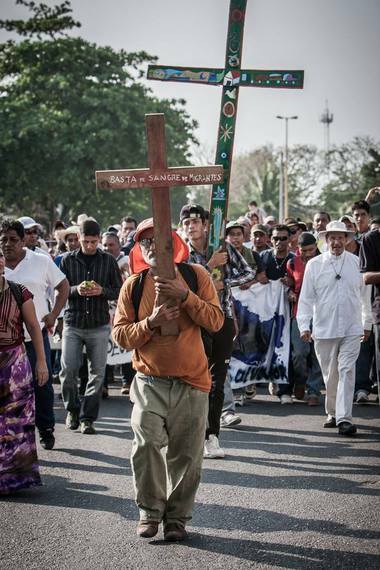 The traveling migrants are part of the fifth annual Viacrucis Migrante -- or the "Stages of the Cross Migration." Organized by a small group of local activists, the Viacrucis is a walking pilgrimage from the town of Tecún Umás, at the tip of Guatemala, to Ixtepec, Oaxaca -- 268 miles in total. Along the way, the organizers invited local undocumented migrants to join the march, set to culminate with a visit to Mexico City, where they would seek formal asylum from the Mexican government. Back in Guatemala, the march began with only its three organizers. But it grew steadily as it moved through Mexico. "They relied on word of mouth to grow in numbers," says Levi Vonk, an anthropologist from the University of Sussex, who made the full pilgrimage alongside the Viacrucis organizers. "Every night, they stopped at different albergues," or migrant shelters, "and told local migrants how the Viacrucis could help them, what kind of services they could offer them." The majority of migrants living in the migrant shelters of Southern Mexico are refugees from Central America. Most are fleeing local violence in countries like Honduras. Some are pursuing economic opportunities in Mexico and beyond. The shelters provide shelter and food as migrants regain their footing or prepare to travel onwards. Trekking through the Southern state of Chiapas, new groups began to emerge to join the group. "We would be walking down the road, and all of a sudden, groups of five, or ten, or twenty people would join us," says Vonk. "The numbers began to swell." They carried signs like "Jesus was a migrant" and charged through local immigration checkpoints with the power of their numbers. 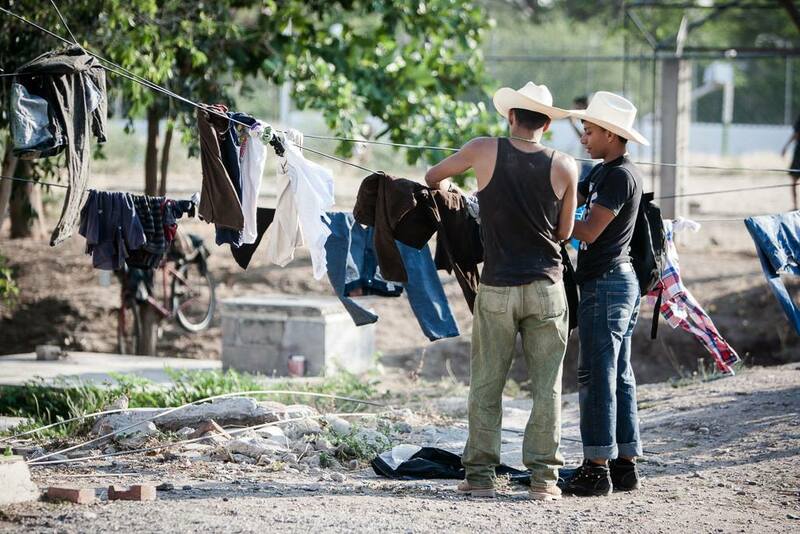 By the time they reached Father Solalinde's shelter in Oaxaca, well over 300 migrants had joined the ranks. The pilgrimage is a direct response to Mexico's new iron-fisted immigration policy known as "Frontera Sur." Following the border crisis of July 2014 -- in which thousands of Central American children arrived at the American border -- Congress renewed its effort to coordinate with Mexico to prevent border-crossings. By July, President Enrique Peña Nieto announced the Frontera Sur program, adding muscle and new resources to Mexico's migration patrol along its southern border with Guatemala. "We are now the servants of the United States," noted Sergio Aguayo, a prominent Mexican academic, at the time. Today, authorities are implementing Frontera Sur program with an iron fist. Over 30,000 Central American migrants have been deported since the launch of the new initiative. For those that remain, life is in the shadows. Migrants must avoid buses and trains where formal documentation is requested, and they must dodge encounters with local immigration checkpoints. Instead, they often travel at night, walking through difficult terrain on their journey North. To emphasize these new hardships, the pilgrimage organizers decided to walk on foot. Previous pilgrimages had used vans to transport migrants through the Viacrucis. But, as the crackdown of Frontera Sur has made these public transport options unavailable, pilgrims walked the entire way up from Guatemala. And through the slow, weeks-long journey, they began to attract international attention to their cause, putting pressure on Mexico's immigration office to bend the rules and provide asylum to the traveling migrants. When they arrived at Father Salolinde's shelter in Oaxaca, however, Mexican immigration forces moved quickly to end the pilgrimage. Officers surrounded the shelter, preventing migrants from exiting the premises. Meanwhile, the government sent threats to the Viacrucis organizers. Anyone that transported the migrants, they claimed, would be arrested for human trafficking. In response, Father Solalinde, with the help of Amnesty International, castigated the Frontera Sur program and the measures taken against the traveling migrants. "This is not a [legal] program because it violates the human rights of the undocumented," announced Solalinde in a local newspaper. "It is a lie that we are going to bring the migrants to the [U.S.] border." Amnesty International issued its own statement claiming that the action violates Article 76 of Mexico's Immigration Law, which prohibits the Mexican government from prosecuting immigrants living in local shelters. Following intense but inconclusive negotiations with the federal authorities, Father Solalinde began to make preparations for the migrants' last stop in Mexico City. The migrants would visit the Basilica of Guadalupe -- completing their Viacrucis pilgrimage -- while Solalinde would present a formal complaint at the National Commission of Human Rights for the failure of Mexican authorities to respect the migrants' right to travel freely through the country. Pushing through beatings and threats from local police, the group inched toward Mexico City. The immigration authorities had installed scores of new checkpoints to confront the migrants on their journey. In many cases, those confrontations involved violence and brutality. But the group charged on, eventually acquiring buses to complete their journey to Mexico City. There, they held mass at the Basilica, and filed charges against the federal police for their abuses. Father Solalinde ultimately succeeded in obtaining a temporary injunction, allowing the 300 migrants to move freely in Mexico. Today, the Viacrucis pilgrimage has finished, and its pilgrims have begun to disperse. The controversy, however, continues to rage. On Tuesday, 24 members of the Viacrucis were arrested in Queretaro, a city just outside of Mexico City. 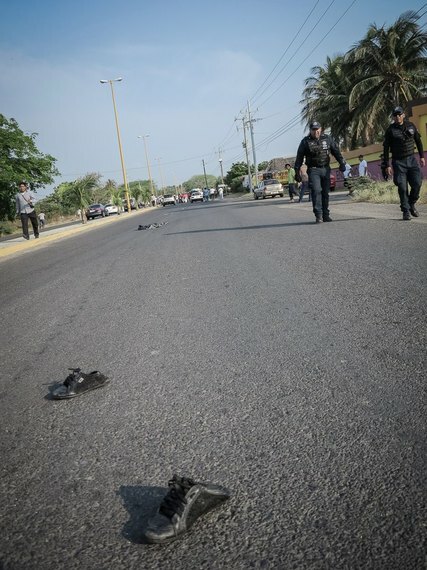 It appears that the injunction -- far from guaranteeing their safety -- was little more than a brief reprieve from the aggressive tactics of the Frontera Sur regime. The outcome of the Viacrucis protest is, then, crucial not only to the fate of these traveling migrants. It is also indicative of Mexico's broader role in the containment of northbound immigration. As the Mexican government confronts a continuous flow of migrants from their southern border, it appears as though they are more concerned with fulfilling their duty to the United States than to respecting their own constitutional commitments to migrant rights. Meanwhile, the Viacrucis pilgrims remain caught in the crossfire.